Phnom Kulen National Park is situated at north east of Angkor Complex about 50 km, it takes approximately 2-hour drive up to the hill top with 487 meters height and plateau stretches 30 km long, it is opened for tourists in 1999 by private owned and charged for $20 toll per foreign visitors. The company developed road up to the peak. It is only possible to go up before 11 Am and only possible to come down after midday, to avoid vehicles meeting on the narrow road. Phnom Kulen National Park is considered by Khmers to be the most sacred mountain in Cambodia and it is a popular place for domestic visitors during weekends and festivals. 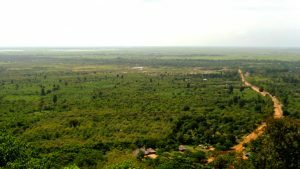 The hill is used as the ancient capital city II in AD 802 to declare himself as god king and announced independence from Java, then giving birth to present day Cambodia. 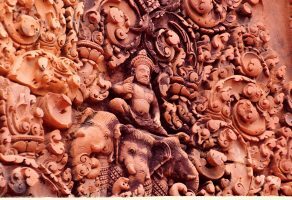 On the hilltop there are 56 Angkorian temples made of bricks and volcanic stones, but most of them are badly in poor condition, today name Hahendrapura, founded in the reign of King Jayavarman temple base only is remain intact. 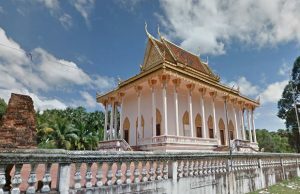 The visible sites in modern day are Prasat krau Romeas, Rong Chen ( the first mountain temple), Sra Damrei (Elephant pond), Thousands of phallic symbols carved a long liver bed and divided in three ports for the Hindu trinity gods. These three ports used for baptistery. 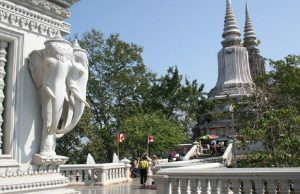 At the summit of the hill you can see Buddhist pagoda and a large reclining Buddha statue 8 meters length carved into a sandstone bock in 16th century. The last attractive spot is a waterfall, it splits in two spots the first waterfall is four or five meters heights and 20 to 25 diameters in dry and raining seasons. The second waterfall is 15 to 20 meters heights and 10 to 15 diameters in dry and raining seasons. The water is considered holy and Khmers like to bottle it to take home with them. The source of water eventually flows in to Tonle Sap Lake and is thought to bless the water ways of Cambodia.